Equipment: 70's model Bear Grizzly 58" 50lb@28"
P.O.C. Shaft with 10" Nock Taper-broadhead was an 125 ACE Standard 2 blade. Distance of shot was 33 yards from climber. Distance ran after shot was 100+/- yards. 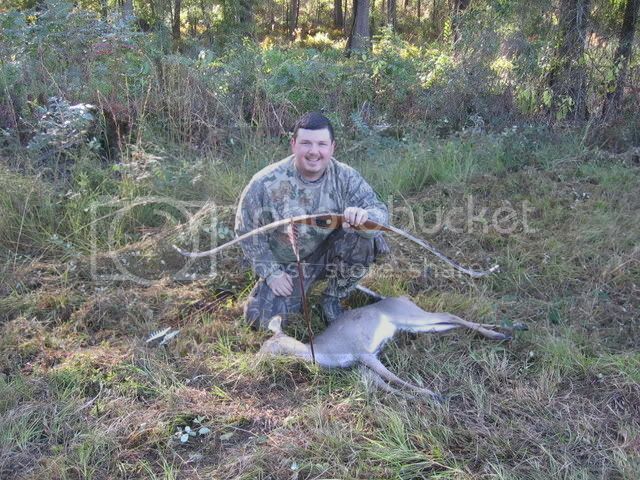 This was my first Traditional Big Game kill after converting from Compounds about 3 years ago. Really not much of a story other than having her and another yearling feeding in some small pines at about 5:00 pm. I had missed this deer already at 20 yards when the first shot went high. The cedar arrows were fairly light (about 450gr) so they did not have the droping effect like my alluminums do. She did not run after the first shot and basicly went back to feeding when she presented another clear broadside shot at what I thought was about 25 yards so I pointed the arrow at her, adjusted for distance, anchored and let it fly. When she was hit she just walked slowly out of the pines with her tail tucked between her legs so I knew she was hit good. The arrow was covered in dark red blood and it was a clean pass thru. I was not sure about the shot so I decided since the night was going to be in the 30's that I would let her die peacefully. Went back the next morning and found her about 100 yards away in a thicket. Shot went thourgh her liver and she bleed out internal. Very little of a blood trail so I had to do a grid search. The shot was long but I had confidence in my bow and arrow setup. Can't see the forest for all the trees..
Tender meat,,, way to go! Congrats! Sounds like that doe was just meant to go home with you. Neat to see the old bow still taking te shots that count.